The purpose of GAAD is to get people talking, thinking and learning about digital (web, software, mobile, etc.) accessibility and users with different disabilities. Is your favorite website accessible? Often websites are designed with the expectation that visitors will be using a mouse. For some people, using a mouse is not possible. 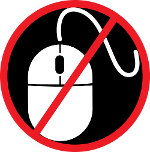 Take the #NoMouse Challenge to see if your site is usable by people who do not use a mouse. Use the [Tab] key to move from link to link on the web page. [Shift] [Tab] moves backward through links. Is there a visible indicator to tell you where you are on the web page. This video, Keyboard Access Part I: Tab Focus, created by the ITS Accessibility Team shows you what to look for. Can you access all areas of the page and website? For example, can you see and select items in dropdown menus? Can you operate all buttons and forms? If you have an embedded video, can you operate the play, pause, and other control buttons? Print the Microsoft Word Accessibility Cheatsheet from the Toolkit, practice the steps and post it near your computer. What does accessibility mean to students with disabilities? This Portland Community College video includes stories from students whose education is impacted by inaccessible web content and ways faculty and staff can improve online course materials to make course content more accessible.